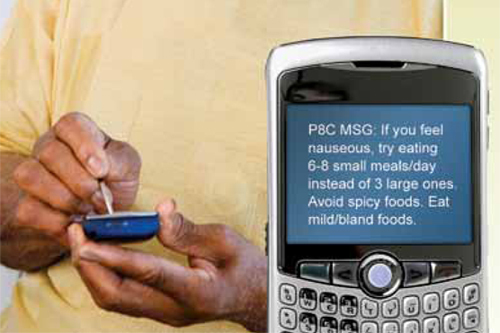 Sanofi has teamed up with US patient group the Prostate Cancer Foundation (PCF) to launch a text message-based compliance programme. The free Prost8Care service is available for men with advanced prostate cancer and sends them SMS messages that are timed to coincide with their chemotherapy treatment cycles. Sanofi, the PCF and their technology partner the mobile strategy and software company Mobile Commons say the messages are designed to increase patients' involvement and help reinforce the information provided by their professional healthcare teams. Topics covered in the messages will include recommendations for addressing certain side effects and tips about food and diet. Howard Soule, the PCF's chief scientific officer, said: “Prostate cancer is the most common cancer in American men, with 1 in 6 facing a prostate cancer diagnosis in his lifetime and 241,740 new cases reported in 2012 alone. The Prost8Care programme would, he added, help those with the advanced stages of the disease cope. The service, which is free to sign up for, will function as a one-way communications channel, with patients directed to their own healthcare professionals if they have any questions. Overall around 85 per cent of American adults own a mobile phone, according to the Pew Internet & American Life Project, and it says two thirds of mobile phone owners check their phone for messages, alerts or calls, even when they don't notice their phone ringing or vibrating. Sanofi's new programme will also be given an offline push, with in-office print materials containing information on Prost8Care and the enrolment process sent to physicians and their staff.